I use humidifiers all winter! I use them when the heat is on. The air gets so dry. I used it all the time when the boys were smaller. I use it how during the winter when the air is so dry. I used to use them all the time in the winter, but I no longer have one. Perhaps it's time I start looking at them again. I have used the vicks one in the past. And my son had a cool mist one in the tiger shape. We have humidifiers going thru the winter. It can get so dry otherwise. Yes, we use a humidifier especially in fall and winter. I have used a humidifier before but need a new one. I have never tried one, but would love to. yes, i always had one in my room as a kid and i think my kids would benefit from this as well. Yes I have used a humidifier but it died and just didn't really have the funds to buy another one. I used humidifiers when my kids were little. Yes I have. In the winter months it is especially needed. Yes, I use a humidifier daily during the winter months. We used one when our daughter was younger. I have used a humidifier and they are so useful if you have allergies, dry nose from all the antihistamines or when you have the flu. We use to use a humidifier in the winter, but ours broke and we never replaced it. I love my humidifier during the winter months and run it daily. We have used a humidifier before. It's a must for kids. We do not currently have one. I have used a humidifier in the past, but currently do not have one. I do like to use humidifiers in our home. I have used one before but it has been many many years ago. Yes, I have used humidifiers, especially in my son's bedroom when he was growing up. Yes, I have used humidifiers. Especially when my kids were little. I need one now for myself and my husband. We use a humidifier in fall and winter. We had a whole house humidifier so it but it died this past year. It was so great!!! This year we had to resort to small ones in the bedrooms. We have to run one in my daughters room especially because she gets bloody noses so bad. To fill them is a real pain. I would love to have a top fill one. Yes, I have used a humidifier before, and I would love to win and try this new Honeywell Humidifier! I've used it when my daughter's been sick. I have used them in the past when I was sick. Haven't used one in years though. I used them as a kid. I use them all the time. We have a fire place so it gets dry in the house. Yes, we would die without our humidifier.. it gets so dry in our house during winter. I have used one in the past and would like to have an EASY to clean and use humidifier now. Leave a comment on this blog post with whether or not you've ever used a humidifier. I've used a humidifier before. I have used a humidifier before, but I don't believe it was a cool mist humidifier. Yes, I have used a humidifier before and I definitely will need to again. I have used a humidifier. They are wonderful while sick. I have never used a humidifier....but I want to try one! We have not used a humidifier in years!! i have not,but i really want to. I have never used one before! I've never used one but have always wanted one especially for when my daughter or i get sick. I have used the vicks one in the past but do not own one now. We have never used a humidifier. I have! They are amazing if you add in essential oils, especially when you are sick! No, I haven't used one before, but I've been wanting to get one for my family. Thanks so much. Yes, I have a humidifier on my furnace. Doesn't work that great -- would like to have a smaller one to use in the living room. Yes, I use a humidifier often. Yes I have a humidifier, but it's not for very large areas. This Honeywell is much bigger and would be great for our use. Been sick for a month flu and then a cold which is lingering. Was just thinking of purchasing one. Yes, I've used a humidifier before. Yes, I have used a humidifier, especially in the winter or when I have a cold. I haven't used a humidifier. Yes we have used one before and they really do help. Thank you for the entry. Yes, I've used one before. Always, I am actually in need of a new one right now! I hope this will help with my daughter's asthma. I have with my kids and I also remember growing up with one in my room when I was sick! I have never used a humidifier and wish I had one now. It's so dry here and my skin isn't liking it one bit. Yes! It works so good when my kids are sick! I have not, but I've been wanting to purchase one! Yes, we use a humidifier when we are sick. I use humidifiers whenever my kids are sick, it really helps! I use to have one years ago so yes, i have used them in the past. Works great as we burn wood and the air gets dry. We have not used one, but I think it would be helpful to our family. I have a humidifier that I use often. We use a humidifier when we are sick, but should probably use one more often! We use one every night in the winter and it is starting have problems. We could so use this! Yes, we have used humidifiers before. Yes. We always use humidifiers. Yes I have when I am sick or have trouble breathing. I haven't, but living in a super dry climate I would benifit from one. I use a humidifier all winter long, one in each bedroom. I use a humidifier for most of the year. I have used a watervaporizer. I have always want to use a cool misty for the summertime. I don't use a humidifier currently but have in the past. I used the same humidifier for many years...loved it. Easy to fill, long running and then it just stopped working, ugh! I have tried several others since but have not found one I like. This one looks perfect! :-) Thank you for this opportunity!!! Yes, I've used bot a warm and cool mist humidifier. They are so helpful when your sinuses dry up. I used to use a humidifier when I had bad allergies, but thats been years ago. I used a humidifier during the winter to help me breathe better. I've had to use humidifiers for 2 of my children. I guess I have not ever used one. I was probably just too stubborn to buy one, could be a good item to have around. Yes we used a humidifier in the winter, we have to purchase a new one each year... we were using the crane, but it seems to break so easy. I have but it's been a while, and we really need to start using one again. Yes, we need humidifiers in our house, especially in winter. Yes, we have but desperately need a new one! My parents used one when my sister and I were little when we had sinus and allergy trouble. My son suffers from year around allergies so I've been thinking about picking up one to see if it would help him some. I've used one for my son before. Yes, we have used a humidifier before for our daughters. I have used a humidifier. Yes, I use humidifiers in the winter. Yes I have used one for my kids when they have sinus issues. I have not used a humidifier before. I have used a humidifier. They are necessary where I live because the air is so dry. Yes, we use a humidifier. Yes, I use during the winter as the forced heat dries the air. Yes, we use humidifiers often in our dry climate. I am always looking for good quality ones that are easy to use. No I haven't used a humidifier. I have one in my garage but I keep meaning to get one for my bedroom. I've heard that they are good for winter. My daughter had one was she was younger. We are considering repurchasing due to allergies. We have two humidifiers that we use every winter. We definitely use a humidifier, all winter long. Without it all of us have sinus and skin issues from the weather. The one we had just finally pooped-out on us so I am in the market for one at the moment. I really like the auto off feature so it doesn't burn itself out. Yes, in the Winter months do but we are needing another one for my daughter's room. yes i used to use a humidifier when i was a kid. i think it would help my husband's allergies. We don't use one but I've been looking into getting one. I have to run one in the winter or I can't breath! The heat dries out the air in the house. Yes. Growing up my father always had one running in the winter to help moisten the cold Midwestern nights. Yes, we have used a humidifier several times. Our house gets so dry that we have to use one. I use a humidifier every night. I am a Laryngectomee survivor. I need one to keep my throat moist. We live in a very dry area. I use a humidifier when my kids are sick with a cold. Thanks! It has been a while, but yes! We have used a humidifier for my son's asthma. Yes, we use a humidifier every night. Yes I have and I like using them. I have used a humidifier, but not for a few years. I use one to combat the dry hot air here in AZ. No, we've never had one before. I hear they're really useful! I haven't used a humidifier because I'm poor and never owned one. But I've boiled water on the stove in place of it! Humidifiers are a must in the winter. I do use them. We do use on but it is pretty old. MY honey has sleep apnea and this helps. I have never used one but have always wanted to. I am an enthusiastic fan of humidifiers! They really help keep my skin hydrated in the dry winter heat. Yes we need them in my house because it's so dry! Yes, especially in the wintertime. I love them. I use a humidifier year round and you can not beat a Honeywell for quality so I am excited about the possibility of winning this one. Yes, we use a humidifier. The Arizona dry heat sometimes affects our health. We've never tried a humidifier, so this would something special. Yes, especially during the winter months. 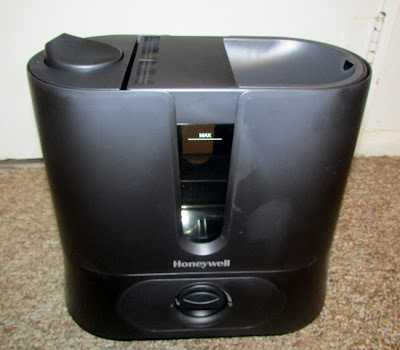 Yes, I have used a humidifier before and I would love to win this amazing giveaway to try this Honeywell Humidifier. Thanks for the chance. We use humidifier(s) in our home during the winter to keep our sinuses healthy !!! My humidifier went out last night, and so far along in the winter. I have to go get one at Menard's. 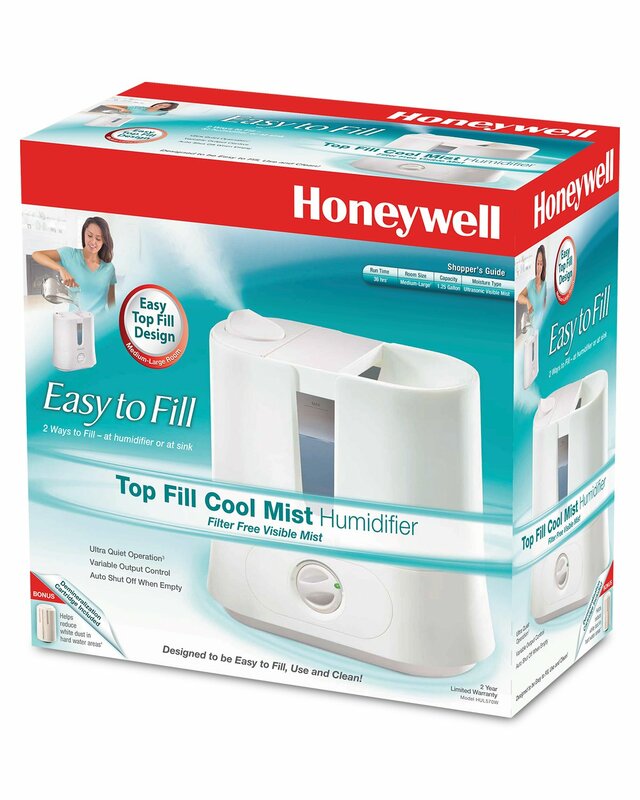 I am in the market for a new humidifier and this Honeywell is awesome! Thanks for sharing.